A wealth of new information includes the "Along Your Route" feature, tracking points of interest as you drive. Comparisons between Bing Maps and Google Maps slice both ways. Google Maps has arguably grown somewhat bloated, but Bing has lacked some of the conveniences its rival offers. With a preview update offered Monday, Microsoft’s offering now has a slight edge over the competition. Go ahead, opt in to the new Bing Maps Web site and check out the changes. Bing Maps has shifted to a card-based format, so you’ll receive plenty of information about a particular restaurant or named destination, before you even think to start asking for directions. You can get a quick description, phone number, address, and even reviews from Yelp and TripAdvisor. Google Maps offers the same collection of information, but organized slightly differently. A wheel icon allows you to pick different views. 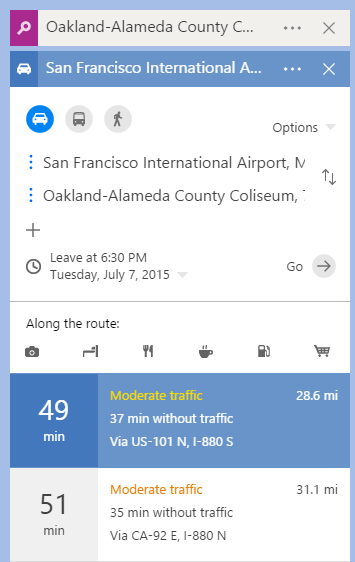 With the new preview, Bing’s navigation feature offers estimated drive times and routes for the future, so you can know, for instance, how much time you should budget for a drive to the airport at rush hour. The card format allows you to examine and chart routes between a number of different destinations all on the same page, without a lot of back-and-forth among webpages. 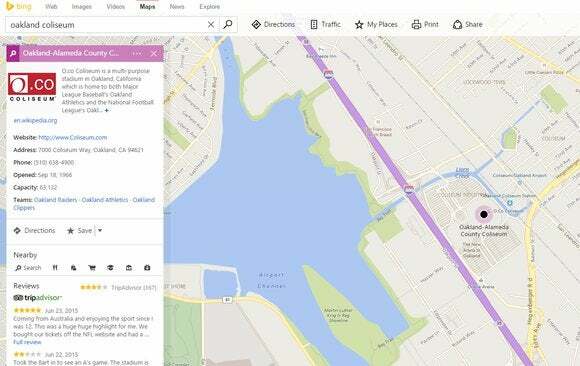 The card motif of Bing Maps Preview shows details in a compact, readable format. Another shortcoming is more glaring: Bing has updated its desktop app, but more and more people navigate using their phones. Microsoft promises a similar preview update for its mobile platforms, which is where its real impact will be felt. Why this matters: On June 29, Microsoft said it would transfer about 100 of its mapping employees over to Uber, who were responsible for image collection and data analysis. Microsoft will now rely on partners for collecting mapping data. In general, this is a good thing: Microsoft won’t be tasked with the laborious challenge of acquiring new information, just presenting it in new and useful ways. Getting out of the mapping analytics business, however, probably means that Microsoft has no plans for a self-driving car.